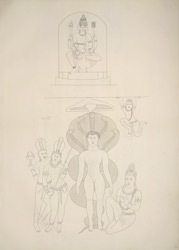 Pen-and-ink and wash drawing by an Indian draftsman of the figure of Dharanendra with Parshvanatha in the Meena Bastib at Aihole, from an album of 31 folios of drawings of sculpture in the rock-cut caves and temples at Aihole and Badami, dated 1853. Aihole was one of the capitals and an important commercial centre of the Early Western Chalukya, a powerful dynasty which ruled the Deccan from the sixth century. Together with the two other capitals of Badami and Pattadakal, the site has preserved many Hindu and Jain temples which belong to a period that goes from the sixth to the 12th centuries, belonging to the Early and Late Chalukya periods and to the Rashtrakuta era. The Meena Basti is a rock-cut Jain cave temple situated south of the village. It was excavated in the late sixth century. It has a long verandah supported by four pillars and two pilasters. The drawing depicts the figure of Dharanendra, the five-hooded serpent friend of Parshvanatha, which is carved at the left end of the verandah. Parshvanatha is the second last of the twenty-four Tirthankaras or Jain saviours. A female figure of Nagini, probably the consort of the Naga that shelters Parshvanatha, stands on the right holding an umbrella over his head. Another Nagini holds a lotus in her right hand. On the left of Parshvanatha a figure adorned with rich ornaments is seated in an attidude of adoration. Another figure with hands upraised is seen on the left above Parshvanatha.